Dan Braid scored the only try of the game as Sale won 16-12 - their first league win at the Stoop since 2008. The victory also means that Sharks have won back-to-back games for the first time this campaign and now sit seventh. "Coming away from home and putting in a performance like that, it is a tipping point for a season," said Diamond. 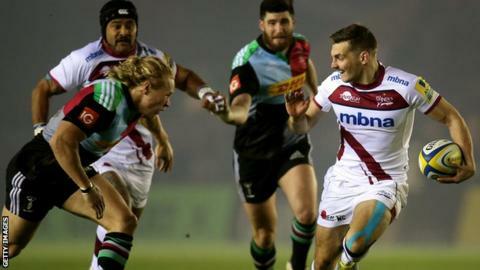 Fly-half Danny Cipriani kicked three penalties and converted Braid's try in a scrappy affair, as Sale ended a four-year wait for a Premiership win over Quins. "We want to have 25 or 30 points by Christmas and that will give us a shot to get in the top six which is really difficult," Diamond told BBC Radio Manchester. "I keep alluding to it, we've not got a massive squad but when we're all fit you get performances like that. "I said last week it was more like the Sale we know and it was a really good performance tonight."